Hello! 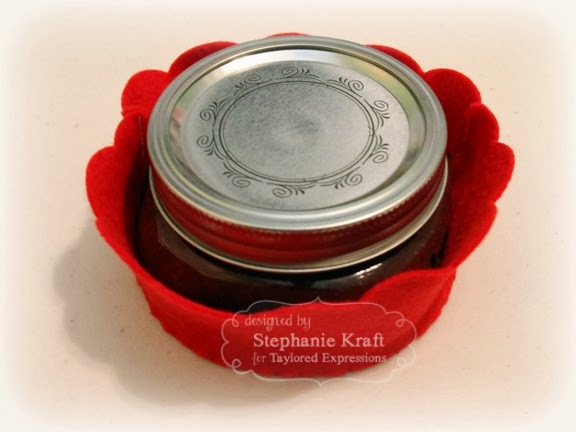 Welcome to Taylored Expressions October Release Day! All new stamps and dies are available in the TE store now! I have a couple of projects to show you today. First is a card using both new cutting plates, the Color Block Cutting Plate and the Snowflake Cutting Plate, which I have layered over a sheet of patterned paper that I created with my Gelli Arts printing plate and paints. I added stitching around the entire plate and around each color block. The Color Block Cutting Plate comes with several layering dies that can be used with or without the cutting plate. 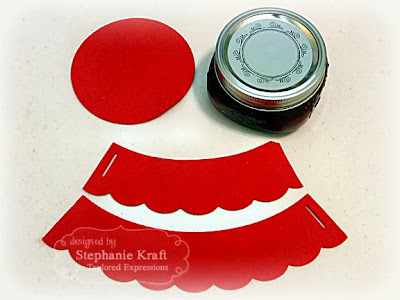 I used a couple of them for my framed sentiment, Joy to the World, which is embossed onto chalkboard paper. The sentiment is from Big Bold Christmas. A few weeks ago, I had more about 6 lbs of plums from my Bountiful Basket haul. I like plums, but not enough to eat that many. So, I decided to make plum jam... the result was 8 jars of yummy (if I do say so myself :)) jam. The first jar went to a friend/co-worker of my hubby. Since it was well received, I decided to make some gift packaging for a few more. 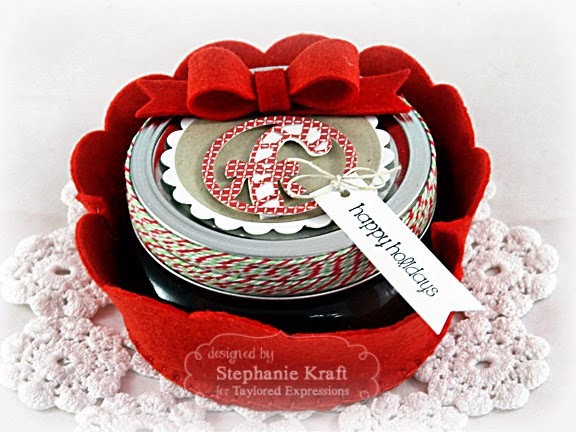 I decorated the top of the jar with a candy cane die cut from Christmas Treat Toppers (one of five different dies that can be used to embellish your cards, scrapbook layouts and even as food decorations). The sentiment is from Baby, It's Cold Outside. 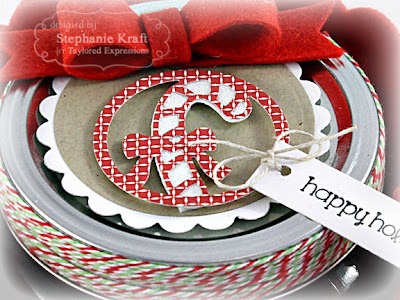 Patterned paper is from the 'Tis the Season Project Pantry Kit. 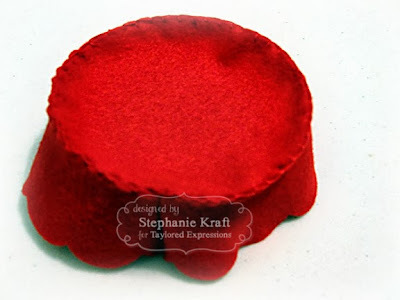 To create my jam holder, I used a full piece of felt cut from the Cupcake Wrap and another partial piece. My jam jars are half-pint sized, but also not the normal canning jars. They are these platinum wide mouth jars. I also cut a circle slightly larger than the bottom of my jam jar. 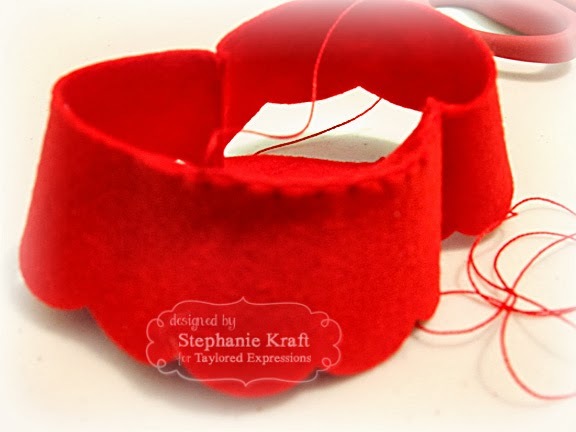 Next, I attached the wrap with the circular bottom with pearl cotton thread using the blanket stitch. 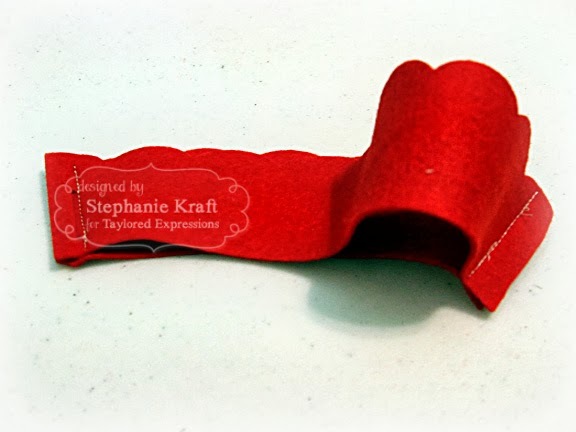 Accessories: Taylored Dies: Color Block Cutting Plate, Snowflake Cutting Plate (TE); White embossing powder, Silver pearls, Foam tape, Thread, Sewing machine. Accessories: Taylored Dies: Christmas Treat Toppers, Mix & Match Bows, Banner Stacklets 1 Cupcake Wrap, Red Hot felt (TE); Standard Circle and Scalloped Circle Nestabilities – Lg (Spellbinders), Glitter tape (American Crafts), Divine Twine, Hemp cord, Foam tape, Pearl cotton, Thread, Sewing machine. 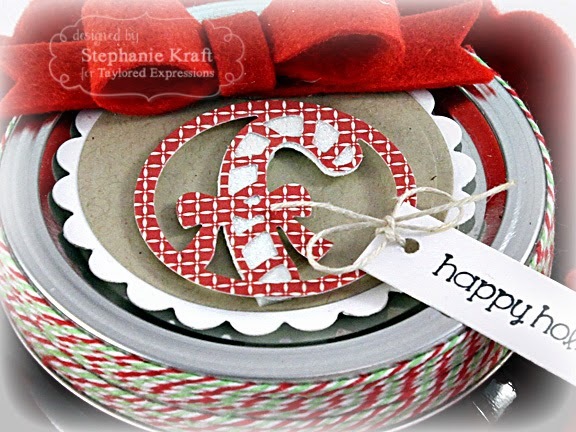 Love how you combined the cutting plates - gorgeous card! This gift is so sweet too! I adore the snowflake card - so much texture and bling too! Gorgeous. And that little gift is so cute! What a gorgeous card, Stephanie!!!! I love how you combined the Color Block Cutting Plate and the Snowflake Cutting Plate to create this beauty and I looove how you decorated the little jars of plum jam....yummm!!!! Wow Stephanie! What a gorgeous card! So elegant looking! The jelly jar bunting is adorable!